This Squirrel is about the Size of the preceedent, many of these being entirely black; some have their Noses only white, some their Feet white, others the End of the Tail white, and some others have white round their Necks. The Tails of there are somewhat less, and not so long as those of the gray Fox Squirrel, yet this little Difference, with that of their Colour, seemed to me at first hardly sufficient to determine them two Species, but by their breeding, associating, and other Circumstances I observed, I am convinced of the common Opinion that they are two different Species. 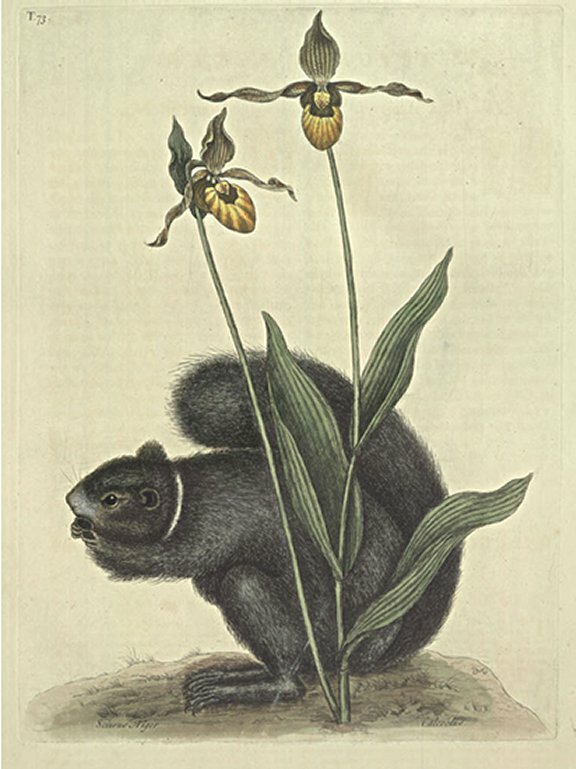 These with the gray Fox Squirrel are very numerous and destructive to Corn in the Fields, for which reason, as well as for the Delicacy of their Flesh no Quarter is given them. This Plant rises with three or more Stems to the Height of twelve or sixteen Inches, each Stem having three or four rough, pointed, nervous Leaves, growing alternately, and enclosing their Stalk at their Basis; on the Top of every Stalk grows the Flower, which is yellow, hollow, of an oblong Form, resembling an Egg on the back-part, tho' on the fore-part open, having an Apron or Lappet hanging over the Hollow: At the Pedicles of which are fixed two small oval Parts or Knobs, of the Size of Ant's Eggs: From the Back of this yellow concave flower grow four Petals, or Leaves of different Dimensions. viz. one standing upright, two more slender and wreathed, spreading on each Side horizontally, and a fourth to the joining of the Stalk to the Ovarium, to which the Flower is fixed; there four Petals are green, thick spotted with brownish red, the Seed Vessel, as I remember, is pentagonal, of an oblong Form, containing innumerable small dusty Seeds; They grow on the sandy Banks of Rivers in Carolina, Virginia, and Pensilvania, from which last Place they were introduced to the Garden of Mr. Peter Collinson at Peckham, where they flowered in Perfection.